The Trinity Lavra is the main Russian monastery. Traditional pilgrim place of the Russian kings. It was established by St. Sergius of Radonezh in 14th century. 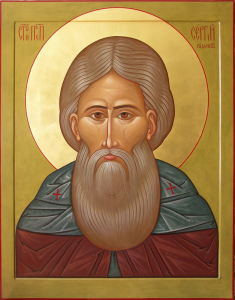 St. Sergius of Radonezh is the most revered Russian saint. He is the Heavenly patron of Russia and the Russian Tsars (monarchs). The island of Manhattan is the historical nucleus of the city of New York. Today, here are the highest skyscrapers, in which there are offices of the world’s leading banks and multinational corporations. Indigenous Indians considered this island sacred. Emigrants from the Soviet Union have traditionally settled near Manhattan, in neighboring Brooklyn, to the south of which the famous Brighton Beach, washed by the waters of the Atlantic Ocean. 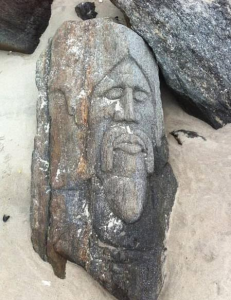 In 2013 the so-called Russian beach unlocked the ancient mystery of New York. A strong storm washed away the mass of coastal sand into the ocean, and stones that had previously been hidden under water were opened. On these stones were found engraved faces of people very familiar to the Russian emigrants from Brighton Beach. Most of them were very close to the Slavic type, including the eyes, the hair style, the beard and the long mustache. One of these images strongly resembles St. Sergius of Radonezh (14th century), although the age of the stone images is believed to be around 5000 years, i.e. they were made about 3600 years before the birth of St. Sergius. 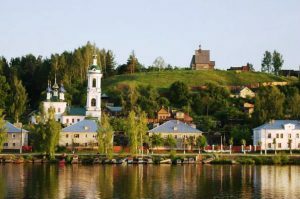 Pereslavl is established on the shore of Lake Pleshcheyevo in the 12th century by prince Yuri the Long-Armed, who is also the founder of Moscow and number of other important Russian cities. 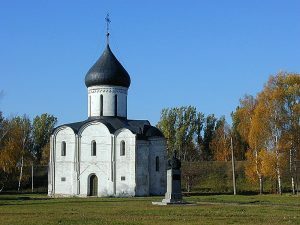 Pereslavl was beloved pilgrim place of the Russian monarchy. It is the birthplace and princedom of Alexander Nevsky (13th century). He is the heavenly patron of Saint-Petersburg. He defeated the Swedish invaders near modern Saint-Petersburg, on the bank of the Neva River. 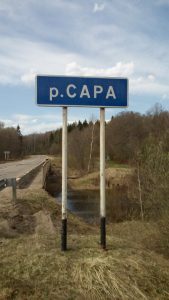 This river’s origin is the Lake Ladoga. Before Russia’s adaption of Christianity, this lake had name Nevo. Interestingly, Mount Nevo or Nebo (in Russian – the Sky) is mentioned in the Hebrew Bible as the place where Moses was granted a view of the Promised Land (the Land of Israel). The view from the summit provides a panorama of the Holy Land. In Pereslavl, Alexander Hill provides spectacular view to the local lake that is among the most sacred and beautiful lakes of Russia. Near this hill is the legendary Blue Stone, on the lake’s shore. Peter the Great (the founder of Saint-Petersburg) made Pereslavl the cradle of the Russian Navy in the end of 17th century. The first Russian fleet was built here to train the sailors on the lake. 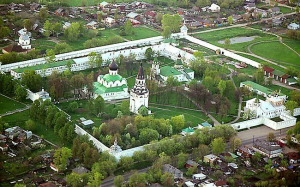 Feodorovsky monastery was established in the beginning of 14th century on the spot of the military battle between the Moscow and Tver princedoms. Young Moscow dynasty was trying to overcome their elder relatives from Tver to become the main Russian princedom. At that time the Tver princedom was among the strongest European states. Moscow was a small village given to the youngest son of the above mentioned prince Alexander Nevsky. There is a legend that rising of Moscow was financed from outside. At that time Russia was separated into several competing princedom and was under the rule of the Genghis Khan’s descendants. Therefore, the money could not be collected inside Russia simply due to their absence. In Europe it was the time of the formal departure from the visible historical scene of The Knights Templar. The order managed a large economic infrastructure throughout the Christian lands and developed an early form of banking. Their treasury was not captured at the time of their formal dismissal. It was taken out of France and saved (or invested) elsewhere. Interestingly, but the royal co-founders of Templar’s order were the descendants of Russian prince Yaroslav the Wise (978–1054), whose daughter married Henry I of France. She was the regent of France during their son’s minority. Anna (1025-1075) was Yaroslav the Wise most beloved daughter. The official dissolution and prohibition of the Order is associated with King Philip IV of France (another descendant of Anna) and Pope Clement V (1264 – 1314) whose mother was from the family of Bertrand de Blanchefort, the sixth Grand Master of the Knights Templar (from 1156 to 1169) and a great reformer of the Order. The main cathedral of Fedorovsky monastery is dedicated to the last king of the Russian Rurik dynasty succeeded by the Romanovs. In Savior-Transfiguration Cathedral of Pereslavl, St. Sergius of Radonezh was appointed Father Superior of the Trinity monastery (today Lavra in Sergiev Posad). Asuras have been worshiped for thousands of years. Hinduism has many stories of competing to each other Asuras (the “older gods”) and Devas (the “younger gods”), but both these celestial groups are the children of Kashyapa, who symbolizes the prehistoric Unity that precedes the Dualism. The most powerful Asura king is Prahlada, spiritually initiated by Narada. Prahlada enjoyed the love and respect of his subjects. Even Ravana was a weakling before the powerful Prahlada. From Indo-Iranian asura derives Avestan ahura, a particular class of Zoroastrian angelic divinities. Ahura Mazda (Wise Lord) is the creator and sole God of Zoroastrianism, one of the world’s oldest extant religions. Major features of Zoroastrianism influenced the later appeared religions, including Judaism, which in turn affected Christianity and Islam. 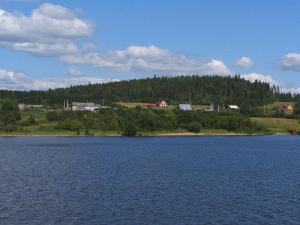 Osurovo is located a few kilometers from the reserved Vashutino Lake and village Vashka. Vedic sage Vashistha is one of the seven great Rishis (Sages) of India. It may not be by chance that words ‘Rishi’ and ‘Russia’ sound similar. Russia is the biggest country in the world and the ideas of justice and equality are the core of Russian soul. Osokino is connected (via the root of its name) to Asoka, the first Indian Emperor and a great spiritual warrior, one of the best monarchs known in the human history. The monastery was founded by the Archbishop of Rostov in 1427 at the birthplace of St. Sergius of Radonezh (1314 – 1392). Rostov Veliky (Eng. Rostov the Great) is one of the oldest Russian towns. It is located on the shores of Lake Nero. Nehru (spelt Neru) was the surname of the first Prime Minister of India after the Independence. His daughter (Indira Gandhi) was the 3rd Prime Minister of India succeeded by her son Rajiv Gandhi. The surname Nehru has originated from the word ‘canal‘. Lake Nero is the mouth or the Sara River. In Sanskrit, the word Sara means ‘essence’. Saraswati is ‘one who leads to essence of self knowledge’. Also, Sara (Sarah) is the wife of Abraham in the Hebrew Bible, the Christian Old Testament, and the Islamic Koran. Abraham is the common patriarch of the three Abrahamic religions: Judaism, Christianity, and Islam. Abraham, originally Avram or Abram, was a Sumerian, like his ancestors. In fact, Christianity and Islam have come out of Judaism, which, in turn, is rooted in the heritage of Sumer and Nibiruans. The main Sumerian festival was the New Year. It was dedicated to the arrival of Nibiru and its ‘gods’. The capital town of the Russian New Year is Ustyug the Great found in the 12th century by the residents of Rostov the Great. Another remarkable significance of Ustyug is the Aquarian on its coat of arm. It is the symbol of the coming new cosmic age that will eventually turn out the Golden Age for the planet. Yaroslavl is the oldest of all the currently existing towns on the Volga that the largest river of Europe (3700 km.) and a symbol of Russian identity. Yaroslavl was found in the beginning of the 11th as an outpost of the above mentioned Rostov the Great, whose ruler was Yaroslav the Wise. He and his men built the first Yaroslavl Kremlin. In the middle of 16th century Yaroslavl became an important place of international trade. European merchants sailed from Archangelsk (the White Sea) to Moscow via Yaroslavl. The Transfiguration Cathedral in Yaroslavl Kremlin has a unique fresco of Christian saint Christopher, made in the 16th century by the order of the first Russian Tsar (close to the star) Ivan the Terrible. Initially, this Christopher had a dog head as the other two Ivan’s Christophers located in Moscow Kremlin (The Cathedral of the Archangel) and Assumption monastery in Sviyazhsk. From the 17th century and onwards the local Christian activists opposed the dog headed image, although they were not supported by their superiors in the Russian capital. Eventually, the dog head of the Yaroslavl Christopher has been replaced by a human head. The traces of the existence of the former image of the saint are still evident. The outline of the canine face is visible on the right side of the Christopher’s nimbus. Dog headed Anubis (one of the oldest gods of Egypt) was associated with Sirius and is one of the most frequently represented gods in ancient Egyptian art. In the 17th century, Yaroslavl was considered the second capital of Russia and was the largest Russian art center. ~ 80 km. east of Yaroslavl is Rybinsk directly connected with the Nobel family (best known for the Nobel Prize) and the founders of Hollywood. Vologda is as an historic Russian city. It was founded in the same year as Moscow (1147). In the 16th century Vologda was going to be the Russian capital. First Russian Tsar Ivan Grozny wanted to move his Royal court from Moscow to Vologda. He built in Vologda the cathedral for crowing Russian monarchs like the Assumption Cathedral of the Moscow Kremlin that is traditional place of crowing Russian rulers. Vologda has a number of famous monasteries that were favored and visited by the Russian Tsars. Totma was first mentioned in the chronicles in 1137. Like Veliky Ustyug, it stands on the banks of Sukhona River, one of the largest rivers of the Russian North (~560 km.). In Buddhism, Sukhavati is the Western Paradise. The term comes from Sanskrit, where ‘sukha’ means ‘delight, joy’. 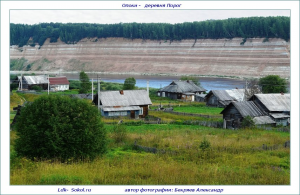 In the 16th – 17th centuries, Totma was one of the most prosperous towns of the Russian North, due to the salt production and to the international fur trade with Alaska. A native of Totma was Ivan Kuskov, the first administrator of Fort Ross, a Russian Pacific ocean fortress in California (Russian America). It is believed that Totma was visited by Ivan Grozny in the 16th century and his ‘student’ Stalin in the 20th century. In the 17th and 18th centuries, Totma was visited several times by Peter the Great, the founder of Saint-Petersburg and the Russian Navy. The museum of Sea Explorers (in the building of the Church of the Entry into Jerusalem) is the main one in Totma. 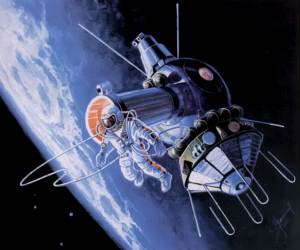 South of Totma was born Pavel Belyayev (1925 – 1970) who was the first commander of the Soviet cosmonaut corps. He was the captain of the historic space mission which saw the world’s first man walk in space in 1965 made by Alexey Leonov whose ordinal number in the Soviet cosmonaut corps is 11. It is also the ordinal number of the Aquarians in the Zodiac. The most astonishing finding in Opoki so far was made in 1993 by a member of Indian delegation associated with Tata Group, India’s largest multinational conglomerate. It was stated that Opoki bear a full resemblance to the description of the Aryans’ ancient homeland described in the Mahabharata, one of the two major Sanskrit epics of ancient India. Literally speaking, Opoki is an up to 70 meter geological exposure of the Permian period which spanned for ~ 50 million years from ~ 300 million years ago to ~ 250 million years ago. The concept of the Permian was introduced in 1841 by Scottish geologist Sir Roderick Murchison, who named it after the Russian city of Perm (near the Urals). Interestingly, the heaven patron of Perm is great Saint Stephan who was born in Ustyug in 14th century. His birth was predicted by the above mentioned Procopius the Blessed, the founder of the Romanovs family. Veliky Ustyug is one of the oldest Russian towns. It was set up in 1147 as Russian capital Moscow. Today Veliky Ustyug is known as the Russian capital of the Aquarius. Astrologically, the Aquarius is the heaven patron of Russia. The only Russian city that has the Aquarius on its coat of arm is Veliky Ustyug. The coming Aquarian Age will transform the planet. 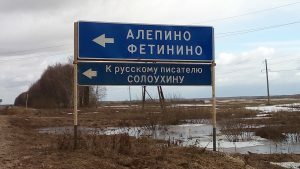 Since 1998 Veliky Ustyug, the government of Moscow and the federal government have been developing the project «Veliky Ustyug is the native land of the Grandfather Frost». 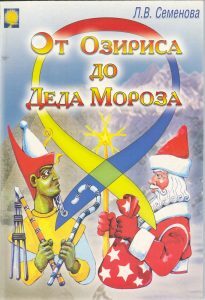 It is based on the idea of uniting people all over the world through contact with universal image of the Grandfather Frost (Ded Moroz), personifying love, belief and hope in the happy future. cap with two projections — a tall straight one in back and a spiral one in front. 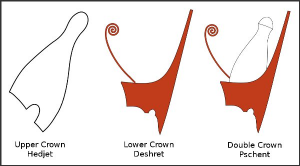 The Double Crown not only symbolized the unification of both parts of Egypt under the divine king but also the unification of The Heaven and The Earth under the this pharaoh. The modern celebration of New Year in Russia (and the world) is rooted in the ancient time. The most known New Year festivals were held in Sumer and Egypt. In Sumer, it was related to the arrival of planet Nibiru. In ancient Egypt, this festival was associated the rise of Sirius. All Russia saint Procopius the Blessed (or Righteous) was the ancestor of the Romanovs Imperial House. He came to Ustyug in the 12th century. On Procopius’ memory day (July 21) the first Romanov tsar Mikhail was crowned as the Russian king in 1613. 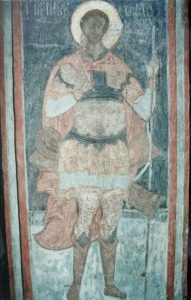 Procopius always carried three sticks in his hand during life in Ustyug. These three sticks could reveal more about his spiritual mission to Russian and Ustyug. The form of these sticks alike to an ancient Egyptian hieroglyph called ‘Neter’. This hieroglyph would symbolize a spiritual way, searching for harmony with the Universe. Also, this hieroglyph might have had some association with the above mentioned Nibiru. The Procopius’ three sticks may also represent the number 777 that is significant in various religious and political contexts. Not by chance, this number is used on most slot machines in the United States to identify a jackpot. Ustyug was given the status “Great” (Veliky) in the middle of 16th century by the order of Ivan the Terrible who was the first Russian tsar (king) crowned like a Byzantine emperor. Ivan introduced official symbols of power and methods that were akin to the ones of Nibiruan rulers. Procopius the Blessed was canonized by the Russian Orthodox Church in 1547, the first year of rule of Ivan the Terrible. The first and most beloved wife of Ivan the Terrible was Anastasia. She was a great granddaughter of Procopius the Blessed and a great-aunt of the above mentioned first tsar of the Romanovs’ dynasty Mikhail Romanov. Pitirim Sorokin (1889 – 1968) was connected with Veliky Ustyug. Pitirim lost his parents when he was 10 years old and started learning only in the age of 14. However, due to his abilities and purposefulness, he became in 1919 the professor of Petrograd University and the first doctor of sociology in Russia. After expatriation to USA in 1923, Pitirim Sorokin created and headed faculty of sociology at the Harvard University, becoming one of world-wide recognized authorities on this area. Among his students was the future president of USA John Kennedy. Full 77 years stayed on the Harvard campus (hung in the tower of Lowell House) the only in the world set of pre-revolutionary Russian bells. The bell set was donated to the Harvard in 1930 by American industrialist, diplomat, and philanthropist Charles Crane. Indeed, no great Harvard ceremony was complete without them. 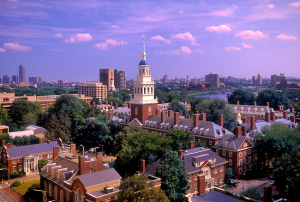 They have become part of Harvard’s culture. After 20 years of formal and informal negotiations, the Harvard agreed to return the iconic Russian bells on the condition of replacing them with a new set bells cast by a Russian foundry. In 2008 the religious artifacts were returned permanently to their one-time home, the Danilov Monastery, the oldest monastery of Moscow and now also the residence of the Patriarch of Russian Orthodox Church, being the largest of the Orthodox churches in the world and only second to the Roman Catholic Church in terms of numbers of followers. The Boston University is located nearby the above mentioned Harvard, on the other side of Charles River (having the same names as Charles Crane). The first president of Boston University William Warren (1833 – 1929) was among the most known searchers who started to look at the North as the place of the cradle of the human race. Warren was extensively quoted by Bal Gangadhar Tilak (1856 — 1920), Indian historian and the first leader of the Indian Independence Movement. Tilak was the first to explore this subject and held the view that further study of Vedic hymns and Avestan passages might reveal the long panorama of Aryan antiquity. Well known is the hypothesis suggesting the location of the ancestral homeland of Indo-Europeans (or Aryans) in the northern regions of Eurasia. As a matter of fact many names of rivers and places in the Russian North and Veliky Ustyug are translated from Vedic Sanskrit (c. 1500 – 500 BC). Remarkable are the similarities of Russian North’s traditional local ornaments and myths’ motives with the ones of Indian culture. The roots of the Russian-American Company Under the Supreme Patronage of His Imperial Majesty are from Veliky Ustyug. This town and its brave citizens maintained the operation of the Russian America (territory from Alaska to California) before 1867, when all Russian-American Company holdings in Alaska were sold to the United States. As it was said above, this monastery was established in the end of 14th century by Saint Kirill of White Lake who had spiritual guidance. Saint Kirill was a disciple of Saint Sergius of Radonezh (1314 – 1392), a spiritual leader and monastic reformer of medieval Russia (see Day 1). In the 16th century, the monastery was the second richest landowner in Russia, after its model, the Trinity Lavra near Moscow. Ivan the Terrible had his own section in the monastery and planned to take monastic vows here after retirement. The Tsar visited the monastery on several occasions. The monastery was always favored by the Russian monarchs. The vast walled area of the monastery has 11 churches, most of them dating to the 16th century. In the end of the 15th century, Nil Sorsky, a former monk of the monastery and a leader of non-possessors movement in the Russian Orthodox Church, founded the Nilo-Sorsky Monastery 15 kilometers northwest of Kirillov (Kirillo-Belozersky monastery). Kirillovsky District is stretched out from north to south and is split into two roughly equal parts by the divide between the basins of the Arctic Ocean and the Caspian Sea. Gor is the Russian name of Horus, one of the most significant ancient Egyptian deities. 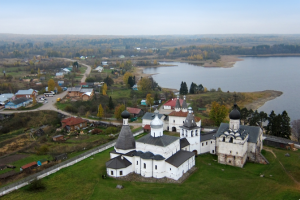 Goritsky monastery in located in the village of Goritsy on the bank of the above mentioned river Sheksna. The monastery was founded in the middle of 16th century by an aristocratic widow. Her husband Andrei was the sixth and the youngest son of the Russian Grand Prince Ivan III and Sophia Palaiologina of Byzantium. Through her eldest son Vasili III, she was also the grandmother of Ivan the Terrible, the first Tsar of All Russia. Ivan the Terrible (1530 — 1584) favored this monastery. 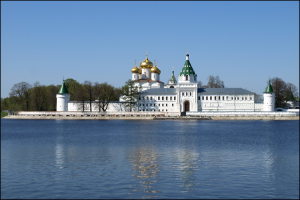 Some famous female members of the Russian royal family have taken here monastic vows. Today the Goritsky monastery has peacocks. In India, a peacock it is traditional symbol of power. The Peacock Throne was a famous jeweled throne that was the seat of the Mughal emperors of India, in Delhi. It was commissioned in the early 17th century by Emperor Shah Jahan, the creator of significant Taj Mahal in Agra. His vast Mughal Empire covered almost the entire Indian subcontinent. But the first Indian empire was built by the Maurya dynasty which dominated ancient India between 4th and 2nd centuries BCE. Most distinguished of them was Ashoka the Great, who is internationally recognized as one of the preeminent rulers in the human history. He spread Buddhism in India and other counties. Ashoka pillar capital of Sarnath has become the State Emblem of India. The peacock was a dynastic symbol of Mauryans. In Sanskrit, peacock is Mayura. Maura Hill is located nearby the Goritsky monastery. The Maura is a part of the Russian North national park that protects natural and cultural landscapes, local places of great historical significance. Maura Hill is a sacred place for the Christians. In 14th century, on the top of that hill, Saint Kirill of White Lake saw the place described to him by the Virgin Mary. He founded there a monastery that became later the one of the most important and wealthiest monasteries in Russia. The monastery is considered one of the purest examples of Russian medieval art, a reason given by UNESCO for its inscription on the World Heritage List. 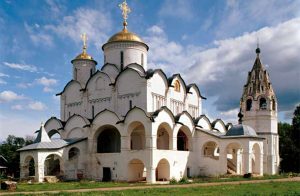 The monastery was founded by Saint Ferapont in the end of the 14th century to the east from the above mentioned Kirillo-Belozersky Monastery. Fellow monks Saint Ferapont and Saint Kirill came together to the inhospitable Russian North from the Simonov monastery, the greatest monastery in medieval Moscow. 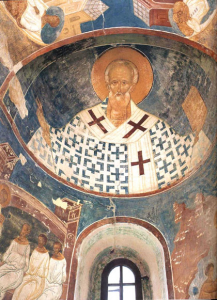 The interior walls of the Cathedral of Nativity of the Virgin are all covered with invaluable frescoes by the great medieval painter Dionisius. This is the last surviving Russian medieval church with fully painted walls. The monastery enjoyed special privileges conferred upon it by the first Russian Tsar Ivan the Terrible. The tsar (close to star) himself frequently visited the monastery as a pilgrim. ornamental carving. One of the most fascinating is the Flower of Life. It is said that the secret to how the Universe works lies within this geometrical pattern. It is one of the oldest sacred symbols known to man and a common symbol of many spiritual teachings around the world. 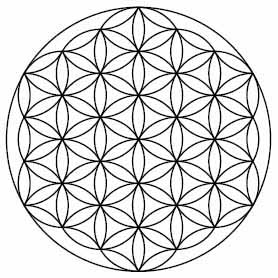 The oldest known depiction of the Flower of Life is at the megalithic temple Osirion in Abydos, Egypt. 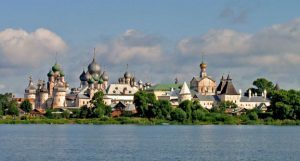 It is believed that Kostroma was founded on the banks of the Volga River in the middle of the 12th century by the above mentioned prince Yuri the Long-Armed, the founder of Moscow. Indeed, Kostroma was the Russian capital for a period of time in the 13th century. In Kostroma the first Romanov Tsar was offered the Russian crown in 1613. The event took place on the feast day of Procopius the Reaper and the birthday of Alexander of Macedon, commonly known as Alexander the Great. From this time onwards Kostroma has been the cradle of the royal and imperial dynasty of the Romanovs. The main holy of Kostroma is the Feodorovskaya icon of the Mother of God. It is considered to be the patron of family happiness. It was used while the inviting of the first Romanov to the Russian throne. Since then, all foreign princesses who married Russian princes took the name of this icon as their second name. The most popular brides to the Romanov Royal family were the German noble ladies. 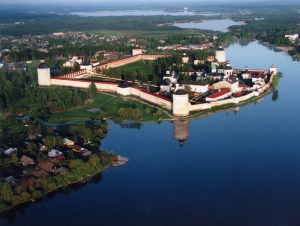 Kostroma is twinned with Aachen (Germany) the capital of Charles the Great (742 — 814), who is called the ‘Father of Europe’. He united most of Western Europe for the first time since the Roman Empire. Aachen is the place where 31 Holy Roman Emperors were crowned Kings of the Germans. Kostroma is also known as the jeweler capital of Russia and the residence of Snow Maiden who is the granddaughter of the Russian Farther Christmas whose capital is the above mentioned Ustyug the Great that was the place of Spiritual deed of Procopius the Blessed (13th century) whom the Romanovs called their ancestor. Plyos is located on the right bank of the Volga River. It is first mentioned the chronicle in the middle of the 12th century. Plyos has become traditional place of recreation and painting. Nearby is the vacation estate of the Russian Prime Minister. Russian landscape painter Isaac Levitan (1860 — 1900) glorified Plyos. Suzdal is one of the oldest Russian towns (10th century). In the 12th century it became the capital of the principality, with Moscow being merely one of its subordinate settlements. After a decline in political importance, the town rose in prominence as a religious center. It has might and beautiful monasteries funded by the Russian kings and many charming churches. Suzdal has a great number of stunning examples of the Russian architecture of the 13th — 19th century, including the Kremlin (fortress) dating from the 10th century. 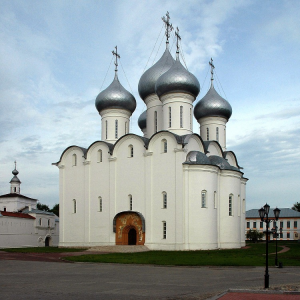 Several of Suzdal’s monuments are listed as UNESCO World Heritage Sites. 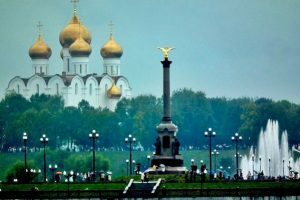 Vladimir has great cultural and spiritual significance for Russia. The earliest settlement of Vladimir is Sungir dated over 30 000 years. It is an Upper Paleolithic archaeological site on the outskirt of Vladimir that is one of the earliest records of modern Homo sapiens in Europe. The wealth of burial items and the complexity of the burial rite are unmatched in the world. 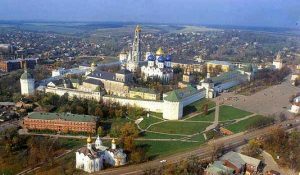 Vladimir became the Russian capital after Suzdal in the second half of 12th century. Moscow became the Russian capital after Vladimir in the 14th century. The Russian monarchs were originally crowned in Vladimir’s Assumption Cathedral, but when Moscow officially superseded Vladimir as the Russian capital, a similar cathedral was built in the Moscow Kremlin. The name Vladimir means ‘owning the world’. The Russian president Putin has Vladimir as his first and the second given name. The same name Vladimir was given by the parents to the current Patriarch of the Russian Orthodox Church. 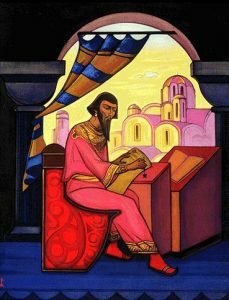 After becoming a monk he took the name after st. Cyril, the Philosopher who was a Byzantine Christian theologian and missionary (9th century). He and his brother Methodius are considered as ‘Apostles to the Slavs’. However, their first but unsuccessful mission was the Khazar Khaganate in order to prevent the expansion of Judaism there. The Khaganate was one of the four mightiest states of that time, along with Byzantium, the Arab Caliphate and the European empire of the above mentioned Charles the Great. The Khaganate’s capital was in the delta of Volga, near modern Astrakhan (the Caspian Sea). Interestingly, the baptizer of Vladimir Putin happened to be the father of the above mentioned Patriarch Cyril, the present Head of the Russian Orthodox Church. In Sanskrit, the word ‘put’ (the root of the surname Putin) means ‘virtue’, whereas ‘puta’ means ‘purifying’, ‘who purifies’, etc. The ancestors of the Russian president Vladimir Putin come from the Tver region that has many names of river and places translated from Sanskrit. The Volga River is also originated from the Tver region. The Vladimir region has number of rivers whose names are translated from Sanskrit. For instance, rivers Agra, Tara, Yada, Ksara, Indrus, etc. In India, Arga was the capital before the New Delhi. Both Indian cites ore located on the sacred river called Yamuna. Yamuga is the name of Russian river near the border of the Moscow and the Tver regions. Moreover, Delhi is the name of a settlement in the Tver region. On 14th century Tver tried to capture the supremacy of Vladimir, but lost the fight to Moscow. The lion with the human on the coat of arms of Vladimir is similar to the incarnation of the Hindu god Vishnu in the form of part lion and part man Narasimha. 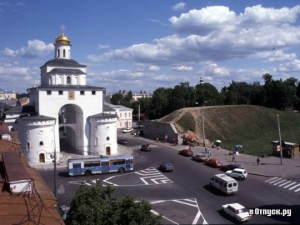 Vladimir has its own Golden Gate, like former Christian capitals Jerusalem, Constantinople, and Kiev. It is written that Jesus will use Golden Gate when He returns. However, only the Vladimir’s Golden Gate is open to entry, the other three are blocked. 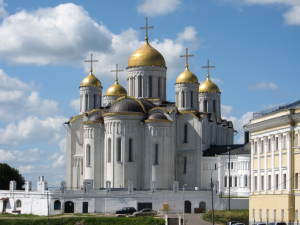 The Golden Gate and the above mentioned Assumption Cathedral in Vladimir were built by Andrew God-Loving. He moved the capital from Suzdal and Kiev to Vladimir. Andrew God-Loving is often called the first Russian tsar (king). There are certain striking parallels between him and Nicolas II, who was the last Russian tsar. July 17th is the memory day of Andrew God-Loving murdered in 1174 in his palace in Bogolubovo (outskirt of Vladimir). In 744 years afterwards, on July 17th 1918, in Ekaterinburg (The Urals), Nicolas II with his family were murdered. Their remains were dropped into Ganin Yama. That is the official but yet uncompleted story. There is version of Romanovs’ salvation. However, today the July 17th is the memory day of the first and the last Russian tsars. Both of them have been made saints. During the celebration of 300 years of Romanov’s rule, Nicolas II visited in 1913 Bogolubovo – the former residence and the place of murder of Andrew God-Loving. 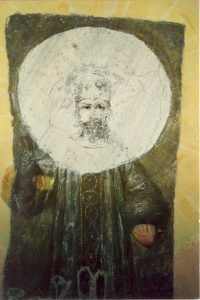 In 1997 in the central cathedral of Bogolubovsky monastery on the ceiling (just over the altar), miraculously appeared the face of Nicolas II. In 2002 after the restoration they found that the place of face appearing was a painting of Jesus wearing a tsar costume and holding in hands the symbols of monarch power, scepter and orb. Vladimir region is the native place of Alexander Suvorov (1730 – 1800), who is a national hero and Count of the Holy Roman Empire, Prince of Italy, and the last Generalissimo of the Russian Empire. His Vladimir estate was called Undol whereas Undal was the main island in the time and place of Atlantis (according Drunvalo Melchizedek and his book The Flower of Life). Not long before the main continent of Lemuria sank, the teachers of Light / immortal masters of the Naacal Mystery School of Lemuria went to the Undal Island and divided it into four quadrants corresponding to the male-female/logical-intuitive functions of human mind. The Ascended Masters did everything in their power to smooth the overall increase of density on this planet and a drastic lowering of consciousness. Hindus interpreted this phase of human evolution as entry into the Kali Yuga (or Age of Darkness). It was then that the Immortal Masters of the Naacal Mystery School decided to divide themselves into three groups and relocate to Khem (now known as Egypt; by the way, Kem is the name of a number of Russian northern rivers and towns), the Andes (Peru/Bolivia), and the Himalayas. There they materialized underground cities and maintained a low profile for many millennia, keeping themselves comfortably aloof on the higher harmonic dimensions. When conditions were right, they sent forth emissaries into this dimension, operating through local mages and sages, holy men, kings and queens. Interestingly, Nacala is a city on the northern coast of Mozambique. Nacala Bay is an area of outstanding beauty. It is believed to be the place of most powerful sorcerers of Southern part of Africa. Aleksandrov is one of the oldest residences of Russian rulers. It is associated with the above mentioned Alexander Nevsky (13th century). Aleksandrov was the capital of Russia in the 16th century under the rule of the first Russian Tsar Ivan the Terrible. There is a legend that his famous library is still in the underground part of the Alexander Kremlin. Peter’s the Great daughter and future Russian Empress Elizabeth lived in the Alexander Kremlin for 10 year. Nikolay Zhukovsky (1847 – 1921) was a Russian scientist, and a founding father of modern aero- and hydrodynamics. He is often called the Father of Russian Aviation. Mikhail Speransky (1772 – 1839) is referred to as the Father of Russian liberalism. He was famous reformer and a close advisor of two Emperors of Russia. Speransky was the author of the complete collection of laws of the Russian Empire. Vladimir Soloukhin (1924 – 1997) was a Russian poet and writer. He was born and buried in the settlement Alepino whose name fully correlates to the Syrian city Aleppo, one of the oldest continuously inhabited cities in the world. Soloukhin was a passionate monarchist and wore a finger ring with the image of Tsar Nicholas II. In 1988 Soloukhin initiated the restoration of the Cathedral of Christ the Savior in Moscow. In 1997 he happened to be the first to receive a special burial praying in this temple after its opening.